Graham Rahal became the first repeat winner of the 2017 Verizon IndyCar Series with near-perfect drive to victory in the second race at Detroit, but had to fend off Josef Newgarden in a two-lap final shootout. At the start, polesitter Takuma Sato held off Andretti Autosport-Honda teammate Ryan Hunter-Reay, Rahal, Team Penske-Chevrolet’s Helio Castroneves and the Schmidt Peterson Motorsport pair of James Hinchcliffe and Mikhail Aleshin. Scott Dixon got his Chip Ganassi Racing-Honda ahead of Will Power’s Penske for seventh, while Simon Pagenaud’s Penske was up two positions, ahead of Conor Daly in the AJ Foyt Racing-Chevy, Marco Andretti, teammate Alexander Rossi, Penske’s Josef Newgarden, Ganassi pair Tony Kanaan and Charlie Kimball, and Dale Coyne Racing’s Ed Jones. Rossi passed Andretti for 11th on Lap 3, but got penalized for blocking Andretti’s retaliatory move. Rossi had to give the position back, and then replicated his move successfully the following lap. Newgarden also tried to pass Andretti into Turn 4, but failed, and when Rossi got penalized for blocking to defend his pass, he had to relinquish his spot. He retrieved it the following lap and Andretti eventually pitted to get onto black tires. Hinchcliffe pitted at the end of Lap 6 but got pinged for speeding on pitlane and had to serve a drive-through penalty. Rahal passed Hunter-Reay for second on Lap 10, as Dixon dropped into the pits for what would turn out to be a long stop due to a refueling problem which dropped him to 18th temporarily. That became 17th when Castroneves also tried to pass Hunter-Reay, clipped the right-front wing endplate of the Andretti car and punctured his rear-left tire and had to crawl to the pits. Hunter-Reay was in desperate trouble with his red tires, and Power, who’d just gotten past Aleshin, demoted the 2012 champion, as did Aleshin and Pagenaud. At the end of Lap 12, Hunter-Reay gave up the unequal struggle and pitted. He would resume in 19th. Up front, Rahal had swiftly moved in on leader Sato, and was running just half a second behind, with Power a further 4sec behind. Aleshin ran 9sec down, desperately trying to hold off Pagenaud, Rossi and Daly. Pagenaud passed Aleshin for fourth on Lap 15, and the following lap Daly pitted. Dixon, was up to 12th despite losing eight extra seconds in his tardy pitstop. Sato set his fastest lap of the race on Lap 19, and Pagenaud in fourth did likewise, with Rahal responding to a closing Power and Pagenaud by setting his fastest on Lap 20. Two laps later Rossi, on black tires passed Aleshin at Turn 4 to grab fifth. Pagenaud stopped at the end of Lap 22, Sato and Power did the same on Lap 23, Rahal and Rossi on Lap 24. Rahal emerged in front of this pack, 4sec ahead of Sato, followed closely by Dixon, Power, Andretti, Hinchcliffe, Pagenaud, Jones, Kanaan and Rossi. Andretti and Jones would drop out of this group for their second stops before lap 30. The leader at this point was three-stopper Newgarden, with a 10sec advantage over Rahal but with 16 laps on his black tires. He was setting fastest lap after fastest lap, inching away from Rahal. Newgarden and Dixon pitted on Lap 29, and this time the #9 team completed their task as slickly as usual. Newgarden resumed in fifth with Dixon 10th. Rahal now in the lead was 10sec ahead of Sato, as Power and Pagenaud ran within a second of each other and the #26 Andretti car, but their teammate Newgarden was closing them down rapidly, with Kanaan only 2.6sec behind them before pitting on Lap 34. Sato set his new fastest lap of the race on Lap 34, but he couldn’t shake Power and Pagenaud. Jones and JR Hildebrand clashed on Lap 35 as the Coyne driver attempted a pass for ninth on the ECR driver. The result was a broken front left wing for Jones, a right-rear puncture for Hildebrand, and they both hobbled to the pits. Jones added insult to injury by then stalling as he tried to leave. The Sato vs Power struggle resulted in both drivers setting their fastest laps on Lap 36, but Sato went even quicker on Lap 37. Despite Sato’s pace, he was 14sec behind Rahal by Lap 40. Right behind Power, Pagenaud had now been joined by Newgarden, who ran nine seconds ahead of Rossi. But Rossi’s fading reds meant he soon fell 13sec behind Newgarden, and was also quickly hauled in by Dixon. The four-time champion passed the 2016 Indy 500 winner into Turn 4 to grab sixth on Lap 45, and Rossi stopped for primary tires a lap later. So too did Pagenaud, while Rahal, Sato and Power stopped on 47, and Power’s crew got him out ahead of the most recent Indy 500 winner. Dixon made his third stop on lap 48, temporary leader Newgarden did the same on Lap 49, Hinchcliffe stopped on Lap 50. Although Power’s crew had slotted him ahead of Sato, he was still in third after all the stops shook out, because Newgarden’s three-stop strategy had worked perfectly and he had rejoined in second, one second ahead of Power, albeit 16sec behind Rahal. Power had no answer to Newgarden who was able to hammer his push-to-pass boost more liberally given his recent fuel stop. Even when Power set his fastest laps of the race on laps 54, 55 and 56, Newgarden was able to stretch away. In fact, the American slipped into the 1min14s, and was chipping away at Rahal’s lead so that by Lap 58, it was down to 11sec. On Lap 60, with 10 to go, Rahal’s advantage was under 10sec and Newgarden had 7.5sec on Power, whose lead over Sato was now 12sec, while in fifth, Pagenaud had fallen to 3sec behind Sato and came under threat from Dixon. Rahal was getting frustrated behind Hunter-Reay, and Newgarden was within 7sec of the lead, but Hunter-Reay moved aside on Lap 66. 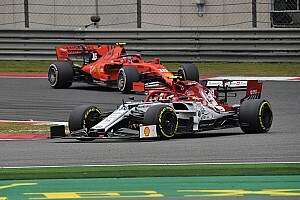 Then all bets were off – with four laps to go, Hinchcliffe’s SPM-Honda engine blew and ground to a halt out of Turn 2 and almost simultaneously, Spencer Pigot’s Ed Carpenter Racing-Chevrolet blew a turbo and shrouded the track in smoke. Rather than finish under yellow, IndyCar Race Control elected to red flag the race with three to go. With lapped cars being ordered to the back for the final two-lap shootout, the lineup was Rahal, Newgarden, Power, Sato, Pagenaud, Dixon, Rossi, Kimball, Daly, Castroneves, Kanaan, AJ Foyt Racing’s Carlos Munoz, Dale Coyne Racing’s Esteban Gutierrez, Andretti and Hunter-Reay. Rahal comfortably had the Penskes handled when the race resumed, however, and it was Power trying to pass Newgarden that became the focal point. But the Australian was unable to pass and unwilling to take a 50/50 chance with a teammate, and settled for third. 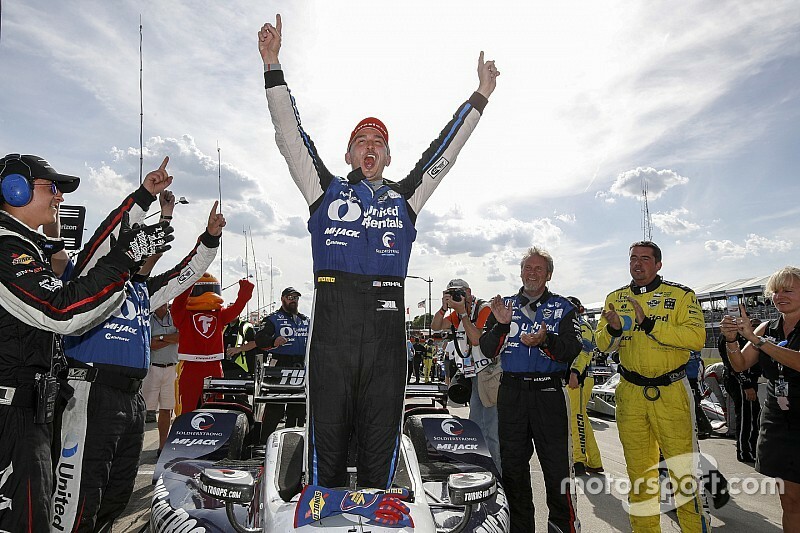 Sato held off Pagenaud to claim fourth, while Dixon took sixth ahead of Rossi, Kimball and Castroneves. Kanaan’s late penalty for running over an airhose dropped him to 11th, while Daly dropped from ninth to 12th to finish just behind teammate Munoz.